On April 14, 2010, the 4th Member Representative Meeting and the 1st Session of the 4th Council of China Alcoholic Drinks Industry Association was held in Beijing. On the meeting the first awarding ceremony “China Wine Industry Yidi Award” was held grandly; Tianguan Group’s president Zhang Xiaoyang won the first “China Wine Industry Yidi Award” and Tianguan Group Company won the first “China Wine Industry Yidi Award Technology Innovation Award”. 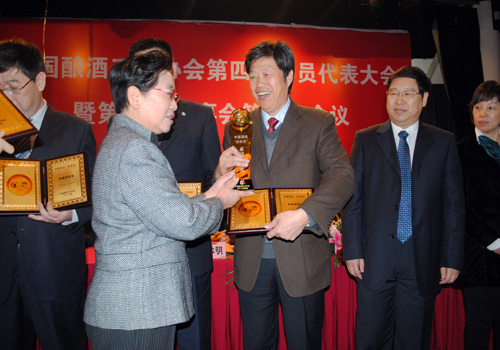 It is reported that “China Wine Industry Yidi Award” is the highest award in the China wine industry. The targets of the establishment of “China Wine Industry Yidi Award” by China Alcoholic Drinks Industry Association include propagation of traditional culture, initiation of social responsibilities, promotion of the company with science and technology and establishment of advanced models. As the highest honorary award in the China wine industry, it combines honor, development, responsibility and product quality and is the national brand award of the industry. This Yidi award appraisal and selection is highly ＆#118alued by all companies in the industry. Through initial selection and recommendation of all branches in the industry as well as the appraisal of the appraisal specialized committee, finally 12 China wine industry Yidi award winners were selected and Zhang Xiaoyang was the only entrepreneur in the alcoholic industry to win this award. This was another highest award in the industry after the Group’s president Zhang Xiaoyang winning the first “China Wine Making Master” title in 2006. Tianguan Group was one of the 9 units winning “China Wine Industry Yidi Award Technology Innovation Award”.